In an increasingly connected world, the traditional centralized enterprise data warehouse model is no longer adequate for providing the big picture necessary for addressing perennial competitive or operational challenges. In many cases, it will require virtualized access to data that is widely distributed in external sources; this data will often be impractical to move. It will also require the ability to sense and respond in real time. 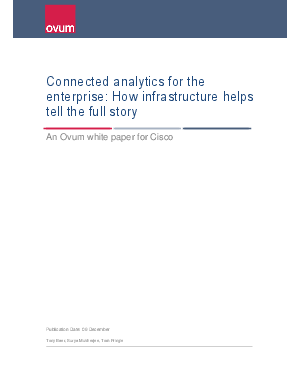 Increasingly, clues to what is happening with critical enterprise business processes will be found in data supplied by underlying infrastructure; indeed, the network can tell a story of how quickly and reliably customers are being served, operations are being run, or fraud or security threats are being repelled.